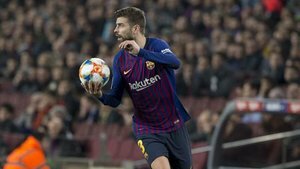 Barcelona defender Gerard Pique, who starts against Athletic Club at San Mames on Sunday, is now the only outfield player to start all 23 league games this season. Ernesto Valverde has decided not to rest the centre-back in the Basque Country, perhaps because of the importance of the game and also because Barça have a free midweek coming up. Pique's played everything in La Liga so far: 1,980 minutes. If he completes 90 minutes against Athletic, that will become 2,070 minutes. Real Valladolid's Fernando Calero was the only player who was competing with Pique, but he's not played this weekend due to suspension. The season in which Pique played most games was 2009-10, playing 32 out of 38. The fewest he played came in 2011-12, when he featured in 22 of 38 matches. In every season he has scored, with his highest total arriving in 2014-15 when he netted five times.